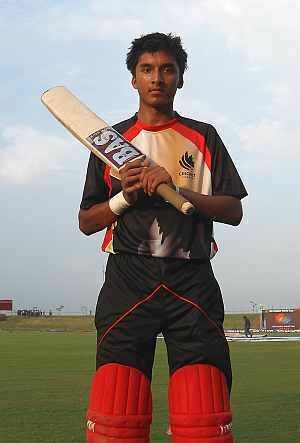 Nitish Roenik Kumar (born 21 May 1994) is a cricketer who plays for Canada. He bats right-handed and bowls right-arm off spin. After representing the country at the 2010 Under-19 World Cup in January, Kumar made his One Day International debut the following month, becoming the second-youngest player in the history of ODIs. When Canada participated in the 2011 World Cup Kumar became the youngest player to feature in the tournament. He played his first Twenty20 International in March 2012. On 14 August 2009 Nitish Kumar played in his maiden first-class match, debuting in the same match as teammate Jimmy Hansra. The match was part of the 2009–10 ICC Intercontinental Cup, and in the first innings against Kenya, Kumar made 12 runs before he was dismissed while in the second innings was out first ball. Kumar made his One Day International debut six months later in February 2010 against Afghanistan, becoming the second youngest ODI player. 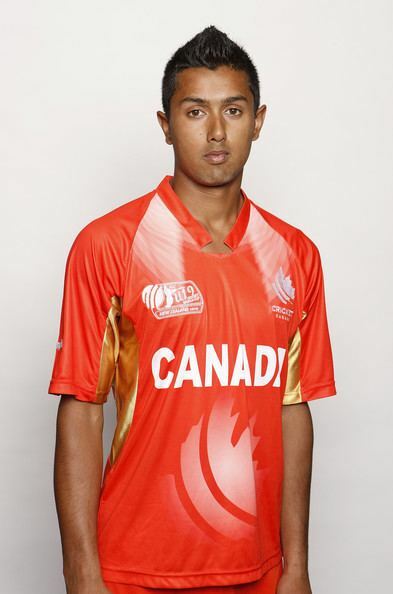 In January 2010, Kumar represented Canada in the 2010 Under-19 World Cup hosted by New Zealand. The team finished in 11th place out of 16 teams. Canada's participation in the 2009–10 ICC Intercontinental Cup concluded in September 2010, when they finished bottom of the seven-team group stage. Kumar played in four Cup matches, amassing 117 runs with a highest score of 74 against Afghanistan (the eventual Cup winners). Canada qualified for the 2011 World Cup held between February and April in Bangladesh, India, and Sri Lanka. The 15-man squad included five players under the age of 21 (including Kumar), all of whom had played in the Under-19 World Cup the previous year. At the age of 16 years and 283 days, he became the youngest player to play in a World Cup when Canada lost to Zimbabwe on 28 February 2011. As expected Canada failed to progress beyond the group stages of the tournament, but secured a victory against Kenya, the only other non-Test team in their group. In July Ireland hosted the 2011 Under-19 World Cup Qualifier. Canada finished 8th out of ten teams, thereby failing to qualify for the tournament the following year. Kumar was Canada's leading run-scorer in the qualifying tournament, and 4th overall with 370 runs including two centuries from nine matches. His off-breaks also claimed eight scalps at an average of 22.87, making him Canada's 4th-highest wicket taker. Canada's first match of the 2011–13 ICC Intercontinental Cup took place in August 2011. The World Twenty20 Qualifier was held in March 2012. During Canada's opening match against the Netherlands Kumar was one of thirteen plays to make their debut in Twenty20 Internationals. He was run out for a single. His second match of the tournament was more successful, and he registered his highest score in twenty20 matches (it did not have T20I status) scoring 57 runs from 44 balls to help Canada to a 6-run victory over Papua New Ginea. With 172 runs from 9 matches, Kumar was Canada's second-highest run-scorer in the competition. The 2013 matches of the 2011–13 ICC Intercontinental Cup offered Kumar further first-class experience, and he bettered his highest score in two consecutive matches. The first, against Kenya in March, saw Kumar score 89 which was the largest contribution to his team's score in the first innings, though Kenya went on to win the match. In August that year Kumar scored his maiden century, this time reaching 103 against the United Arab Emirates.